HomeBloganti-theft backpacksHow to label school backpack? We often talk about how careless children are with their belongings; they often misplace their valuable belongings at places where it is impossible to find them. Anyways, who thought they even had the potential to misplace the entire backpacks? Yes, you read it right! The entire big school backpacks being misplaced by students. It seems quite impossible, because backpacks are not the size of a sharpener that could be misplaced, but here we are, children misplacing backpacks. However, children can not be blamed completely for this because the major reason of the misplacing of school backpacks is that many children have the backpacks of same designs or colors. So, students can take someone else’s backpack home and the two students who took each other’s backpacks would not realize what they have done until they reach home and open the backpack. Anyways, there is a solution around this problem, and that is to label the school backpacks of children with either their names or any other identifiable thing. Labels would keep children’s backpacks differentiable than other similar backpacks. This way, the chances of mixing the backpacks with others is reduced substantially. There are several ways to label your school backpack. First, the easiest way is to place a sticker on the backpack with the child’s name or any other thing written on it. The sticker is your cheapest option, because you can print several labels on a single A4 sticker sheet and use it repeatedly. You can print the name or anything you would like to print in any font or design or color you would like. Even if you do not have an A4 sticker sheet available, you can simply write on a paper tape and stick it to the backpack. ‘Canvas Backpack for Men and Women’ and ‘Baibu solar backpack’ at Gizmoist.com have sticker friendly surfaces. However, the downside of this way of labeling is that the sticker is not that durable and can come off very quickly, so it needs to be changed frequently to keep the method effective. Adding to this, the sticker would destroy the looks of the backpack. Another way to label the backpack is to tie a label to its hand carry strap or the shoulder strap. A simple paper or card can be used to write the name on it and then tied to the backpack through a small thin rope or a thread. Another even stronger way to tie a tag is through a plastic or nylon locking strip. These strips even come in reusable versions. This must be noted that you should not make any holes in your backpack, because it will destroy the backpack’s material; you should just tie the label through any of the many straps on the backpack. The downside of using this method is that the labels can get torn by being trapped into something, for example a hook or a car’s door. Adding to this, the thread or the rope through which you tie the label can get broken due to any sort of pressure or forced pulling. Another way is to use a key chain. You can attach any random keychain to the backpack just to keep an identity of your backpack. The keychain is a distinct object which is not there on everyone’s backpack, and a unique keychain can set your backpack apart from others. Adding to this, there is even a possibility now that you can get your child’s name printed or engraved on the keychain too. The name permanently on a keychain is not only stylish, but extremely unique too. It is extremely easy to identify as well. However, the downside of using a keychain is that keychains can be attached to the zips, and zips are on the backpacks’ sides, not at the front, so someone can miss the keychain and take someone else’s backpack by mistake. 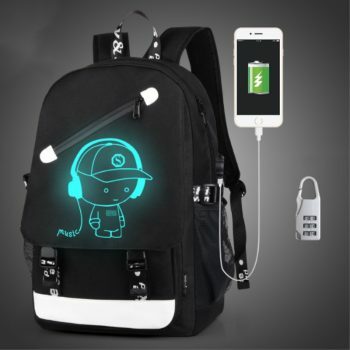 A backpack at Gizmoist.com which has a front zip too is ‘Anti-Theft Waterproof Crossbody Messenger Backpack’.